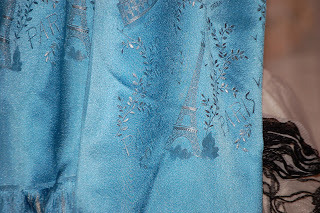 I couldn't rest at simply one post displaying all of my lovely French gifts from Q. I still can't stop looking at them, they are so beautiful. 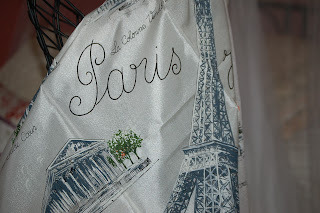 These silk scarves are now draped over my French form, but I have plans to frame them in the future...I may stop off at IKEA on my way to work this afternoon to find the prefect frames for them. Q also had the great suggestion to tie the scarves around a handbag...très chic! The Eiffel Towers are sitting next to my antique typewriter on my hope chest, as are the adorable French wooden finger puppets. And the Eiffel Tower cookie cutter has found its home in one of our kitchen drawers, waiting for a batch of sugar cookies to appear! Mmmmmm.....Eiffel tower cookies...now who could resist those? Yummm cookies, I knew you would be able to use these things. They are in a good home. So happy you are enjoying them. I think all of your French things are so nice, and fun. 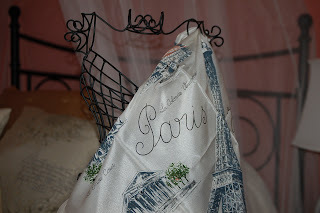 By the way, I love the Paris scarf. 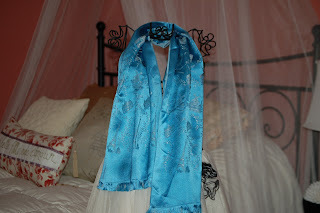 They are gorgeous scarves!! Defintately think a trip to Ikea is in order- if you are anything like me, you will come back with more than just frames...!!! These gifts obviously went to the right home..! You are really enjoying and appreciating them..! Those scarves are just wonderful! and what a great idea to frame them. Parfait! Le Jour De Père Heureux !